The igHtmlEditor control is a jQuery HTML editor control that features standard HTML editing capabilities. Formatting options include font face, font size, text and image alignment and link and table support. Further information regarding the classes, options, events, methods and themes of this API are available under the associated tabs above. The following code snippet demonstrates how to initialize the igHtmlEditor control. The html editor custom toolbars list. Set or get the widget height. The name attribute of the html editor source view. Shows/hides the "Copy Paste" toolbar. Shows/hides the "Insert Object" toolbar. The html editor toolbars list. Used to render inside the html editor as initial content. Set or get the widget width. Event fired after a toolbar item is clicked. Event fired before a toolbar item is clicked. Event is fired on keyboard copy action. Event is fired on keyboard cut action. Event is fired on keyboard paste action. Event is fired on keyboard redo action. Event fired after the whole html editor widget has been rendered. Event fired before the html editor widget has been rendered. Event fired after a toolbar is collapsed. Event fired before a toolbar is collapsed. Event fired after a toolbar is expanded. Event fired before a toolbar is expanded. Event is fired on keyboard undo action. Additional paramaterd for the command. Gets the content of the html editor. Returns the content as html or plain text. Values can be "text" or "html". Returns true/false if the editor contents were modified or not. Sets the content of the html editor. The content which will be set. The content type: "text" or "html". Returns the element on which the widget was instantiated. The widget base class css. The html editor content styles. 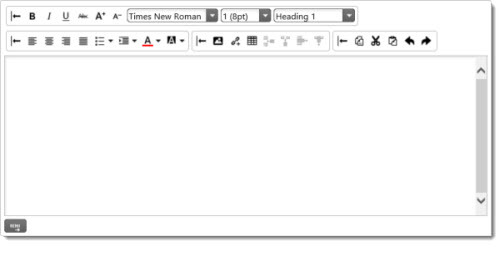 The html editor dom navigation toolbar css. The html editor toolbars style.